Are you looking to create a foolproof digital marketing plan to succeed online? Digital marketing is all about promoting (or selling) your products or services through various online marketing channels which include the following. To put it simply, digital marketing helps you generate traffic, leads and sales from various online channels (as mentioned above) to your website, eCommerce stores and so on. If you’re new to digital marketing, you must need a plan to drive solid leads and sales to your online businesses. This page is exclusively for you where you can discover how to create a solid digital marketing plan to drive more traffic and sales to your business. So let’s get started without much ado. Why do you need a digital marketing plan? Preparation is the key to succeed in any business including digital marketing. If you want to drive more leads and sales from online, having solid digital marketing helps. No matter what industry you are in, you will find a path to success if you have a digital marketing plan. Without it, you’ll struggle in the long run. It’s as simple as that. A digital marketing plan is something which acts as a “blueprint” where you can plan your marketing strategies to grow online. The good thing about having a marketing plan is that you can easily visualize your future goals (and avoid bad consequences from happening). That being said, here are a few interesting digital marketing stats you should know. So there you go. Digital marketing is growing rapidly and here’s how to structure proper digital marketing to grow your online business in 2019 and beyond. Here’s a simple yet most effective step by step tutorial on how to lay out a digital marketing plan that works like a charm in 2019. Whether you want to start a digital marketing agency or any other online business, if you want to succeed online, you need to clearly set your marketing goals. At least once a month (or every quarter), you need to clearly find and analyse your marketing goals. Only then you’ll know whether you’re going on the right track or not. To set clear goals for your online success, you need to have a vision. No matter how many new products Google launches (ranging from Google Trends to Keyword Planner to search algorithms like RankBrain), it’s clearly noticeable that Google is trying hard to accomplish that vision. So make sure to set a vision or mission statement for your business so you can easily set goals for your digital marketing campaigns. So what is SWOT analysis? SWOT (Strengths Weaknesses Opportunities and Threats) is all about finding opportunities by knowing your strengths and weaknesses to capture a market in any industry. From Uber to Facebook to Amazon, everyone has their own SWOT analysis to dominate their market. That’s why almost all the successful companies come up with new ideas to improve their businesses even further. So if you’re jumping into digital marketing, you must need a SWOT analysis if you want to get ahead in your business in 2019. Let’s now briefly talk about the 4 different components of SWOT. Knowing your weaknesses is equally important as knowing your skills. Only by knowing weaknesses, you’ll be able to overcome them to get ahead in your business. Here are a few things you need to check out while analysing your weaknesses. Here’s a list of things that can help you identify opportunities in your industry. Here’s a list of threats you need to identify to improve your odds of succeeding in your business. All in all, once a detailed SWOT analysis is done, you can easily tweak your marketing efforts whenever you find any new threats or opportunities. There is a wide range of digital marketing channels out there which include email marketing, influencer marketing, PPC advertising and so on but SEO is one thing that stands out from the remaining channel. If your digital marketing plan fails to implement an SEO strategy, you’re going to fail sooner or later. If you’re wondering why you need SEO for your digital marketing efforts, here are few stats around SEO (search engine optimization) you should have a look at. You can see from the above stats, why it’s essential to implement an SEO strategy if you’re laying out a digital marketing plan for your website or online business. So how you can create and implement an SEO strategy that actually works? We’ve been using few SEO tactics since 2014 and we’ve got exceptional results both in terms of traffic and sales and here are what worked really well for us (you can implement the similar tactics as well). Quick note: To make SEO work effectively for your business, make sure to start a blog as it helps you create content, drive more search traffic, create awareness about your products and services and so on. We’ve written a detailed tutorial on how to start a WordPress blog where you can find all the details on how to start a professional blog within 10 minutes. Create highly in-depth content: Your SEO strategy starts with great content. If your content is not good enough, no matter how great your marketing efforts are, they will all go in vain. The best way to bring more search traffic is to write highly informative and long form of articles. Whether you know it or not, writing 2000+ word long articles tend to rank well in search engines like Google. Long articles also attract more social shares and engagement from users when compared to short articles. Make sure to perform keyword research: Keyword research is all about finding profitable keywords so you can bring more visitors from search. If you’re finding the right keywords, you’ll not only increase your search traffic but also your website overall sales. Never forget to build backlinks to your website: Ultimately, your SEO success depends on how many backlinks you’re attracting to your website and most important pages. There are a ton of ways to build backlinks no matter what industry you are in, but there are few link building strategies that are evergreen. Getting help from mentors is one of the secrets of the most successful people in all kinds of industries. Learn as much as you can and that’s the key to success. Here are a few resources you can use to learn more about your market, industry, products and so on. The key here is to learn as much as you can so you’ll have enough knowledge to run a successful business online. Having access to the right digital marketing tools help you but if you’re going to launch an online business, eCommerce portal or a website to make money in the long run, you need a team. Do you think you can handle all the above things by yourself? It’s highly unlikely especially when you have a full-time job. Yes, you can handle most of the things if you can spend at least 5 to 6 hours a day, every day. We recommend you to work harder by yourself and once you start generating profits from online, you should start investing money on hiring the best team to generate faster results. That being said, there are few places where you can hire people and invest money to get faster results from digital marketing. For content marketing: It doesn’t matter what industry you are in, you need to create content to generate results such as traffic, backlinks, leads, sales and so on. And it takes lots of efforts and time to create great content that actually generates results. So find someone who can manage your content marketing tasks such as coming up with blog post ideas, creating content, editing your content, publishing it. This can alone save you 80% of the time so the money you spend on content marketing (or content marketers) is all worth it in the long run. For SEO: We’ve already talked above about the importance of having an SEO strategy, if you’re running an online business, website, eCommerce store or anything relevant, you need to find someone who takes care of your SEO related things. For networking: Networking with influencers and bloggers in your industry can go a long way. Not only it helps you grow your traffic but it can help you find the right customers to improve your overall sales. For sales and conversions: Last but not least, you need someone to look at your sales figures and website conversion rates. After all, they are the most important factors that can make or break your online success. Most business owners take care of the sales part by themselves and when it comes to conversions, you’ve multiple options like hiring a conversion marketing expert or using tools like Crazy Egg to easily find out your audience behaviour and tweak your strategies to improve your conversions. So how to create a digital marketing plan that works like a charm? Here’s an easy to use digital marketing plan template you can use to create a solid strategy to drive more traffic, sales and leads from digital marketing in 2019 and beyond. You can download the digital marketing template from here. To put it simply, the above template is a 1-page quick guide which helps you easily lay out a foolproof digital marketing plan for your business in 2019 and beyond. Just make sure to take time to fill out the template so you can achieve great results with your digital marketing campaigns. Let’s now talk about a few real-life digital marketing examples which are implementing solid digital marketing plans to generate more profits and traffic to their sites. Buffer is one of the best social media management platforms that you can use to manage all your social media activities such as posting, sharing, scheduling and so on. Buffer is definitely one of the best example websites that fully use the power of digital marketing. How does Buffer generate income? Buffer mainly uses “content marketing” to educate their audience and attract more people to buy their stuff. When you visit their homepage, you’ll see a call to action where you can get started using their tool for free. Once you click on it, they will ask you to sign up to their platform by using your email. You’ll instantly get free access to start using their tool where you can manage up to 3 social media accounts where you can schedule up to 10 posts a day (with their free plan). It also offers various pricing plans starting at $15 per month which go all the way up to $399 per month (suited for large agencies). How do they get more traffic and customers? Currently, Buffer has over 80,000 customers worldwide and they are literally earning millions of dollars every year. So how are they generating traffic and customers? Content marketing. Yes, Buffer uses content marketing to drive more traffic and sales from search and social media. Buffer is known for providing in-depth and high quality contents around social media. If you read their blog for a while, you’ll definitely start using their tool to manage your social media accounts. That much powerful their digital marketing plan is. SEMrush is the #1 SEO toolkit that helps you do almost everything from keyword research to competitor analysis to site audits and so on. It also has a blog which offers SEO related tips along with the tutorials on how to use their tool (which ultimately brings them more customers). How does SEMrush generate profits? SEMrush offers the following 3 pricing plans where it makes all the money. SEMrush is used by over 3 million people worldwide and that’s a lot of money involved. Since they offer subscription based pricing plans, so their recurring income is huge. Quick note: You can use this link to get a free trial of SEMrush (which is worth around $47) and you can access all of their SEO features such as keyword research, backlink analysis and so on. SEMrush mainly gets traffic from search engines. As we discussed earlier, SEMrush writes a lot of highly useful blog posts every single month (mostly from other contributors) and almost all of their contents are properly optimized for search. Besides search traffic, they also get traffic from paid ads, social media, email lists, influencer marketing and so on. 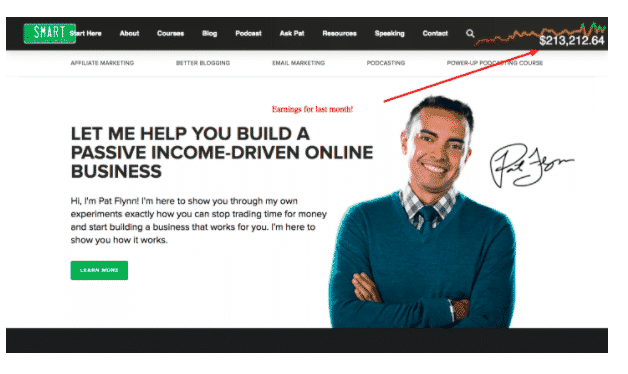 Smart Passive Income is run by Pat Flynn who is considered as one of the top affiliate marketing gurus who shares a ton of practical advice on making money online. How does Smart Passive Income make money? Pat Flynn earned over 2 million dollars in the last 12 months alone. Here are the income sources of this blog. How do Pat Flynn get more traffic to his site? Smart Passive Income traffic comes from the following channels. Backlinko is the best SEO blog where you can learn everything from keyword research to link building to competitor analysis. Backlinko is run by Brian Dean who’s an SEO expert. How does Backlinko make money? Brian Dean from Backlinko’s major income source is selling online courses. He makes money from an online premium membership site called “SEO That Works” which costs around $1000 and he’s open to the people only once or twice a week. His seats sell like hot cakes and he also offers SEO advice to all kinds of companies, brands and marketers. How do Brian Dean get traffic to his site? Brian Dean published only around 30 blog posts on his blog so far (he launched it in 2012) but each and every blog post is a gem which is really informative and contains a ton of information. He mainly gets traffic to his blog from search engines like Google and his site attracts a ton of backlinks from authority sites. Last but not least, we’ll be featuring our own site Bloggers Passion in the list. Bloggers Passion (the blog you’re currently reading) is where you can find all resources ranging from SEO to blogging to affiliate marketing to build a money making blog. How does Bloggers Passion make money? In the last year i.e 2018, we earned around $106,000 (in a single year) from Bloggers Passion. Here are some of the income sources of Bloggers Passion. You can read our post on 2018 Bloggers Passion income report to find more details on how did we generated over $100k within a year. How do we bring more traffic to Bloggers Passion? Majority of the traffic comes to Bloggers Passion from search engines (around 80%) and there’s a reason for it. We believe that search engine traffic is the most qualified traffic source which sends “highly converting visitors” and that’s the reason why we focus on SEO. We often create in-depth articles by keeping specific keywords in mind (and we also make sure to optimize them well for both search engines and users). That’s how we generate more search traffic. Apart from search engines, we’re now focusing on diversifying our traffic sources by spending more time on Facebook groups, Quora, YouTube and so on. Having a digital marketing plan helps you determine your goals, objectives, strengths, strategies to implement and so on. It’s not so easy to succeed online especially when you don’t have a plan. That’s why you need to use the templates (which are already provided on this page) to improve your odds of success in digital marketing. Did you enjoy the detailed guide on structuring a digital marketing plan for your business? Do you’ve any questions? Do let us know your thoughts in the comments below. Nice post I personally like to read Digital marketing blogs, watch inspirational videos on YouTube and talk to fellow marketing professionals to keep myself inspired to create marketing content. Nice post! This is such a gold mine. I loved the strategies and lots of unique techniques for digital marketing you have mentioned in here. Thanks for putting this together for us. I’m definitely hanging on to this one and indeed passing it on. Thanks for sharing useful post, Anil! Another great article, Anil! Indeed, you really know a lot about digital marketing and what you wrote here is truly relevant. This guide is not just for beginners, but it is useful even for those who have been in the digital marketing industry for quite some time now. It’s always great to learn a thing or two from an expert in SEO and all the blogs you’ve written never fail to educate everyone who is eager to learn more about the digital marketing industry. Keep posting and thank you for this amazing read! Cheers! That’s so true, couldn’t agree more. Thanks for stopping by! Nice article, do you agree that photos and videos are the next-gen tools of marketing? Use of high-quality meaningful images & engaging brand videos is performing well in the market.